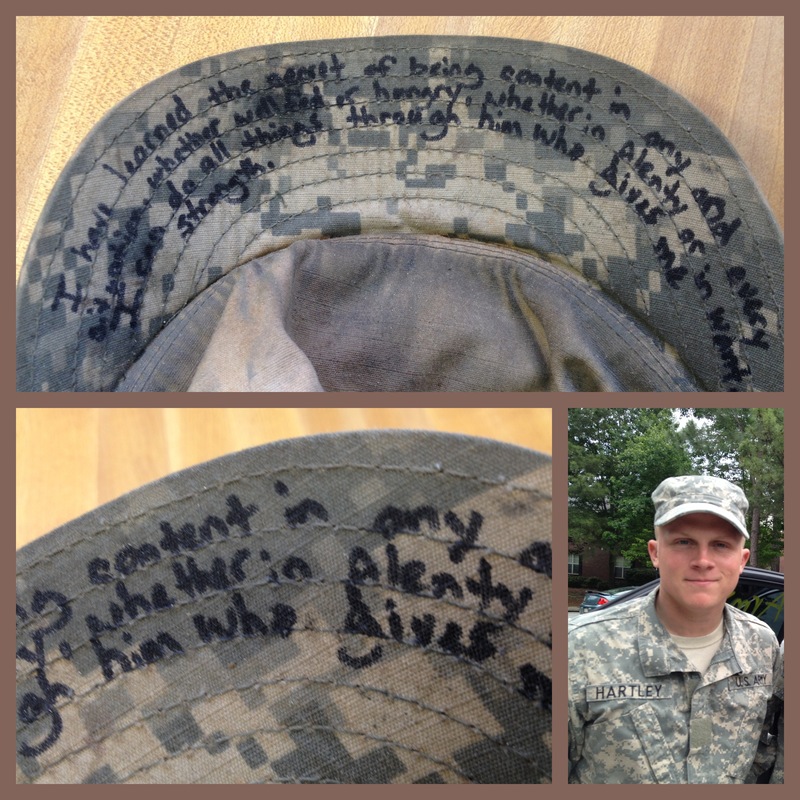 While in the process of doing laundry during Nate’s eight-hour pass from Ranger School, my Soldier’s filthy patrol cap appeared among the pile. “How can a person’s head get so gross?” I wondered this in the confines of the hotel laundry room. Ew. But that Army cap became a thing of beauty when I looked beyond the grime. Oh how I love this child. Unbeknownst to me, prior to starting Ranger School, my Soldier had written in black Sharpie pen these words found in Philippians 4:12-13. 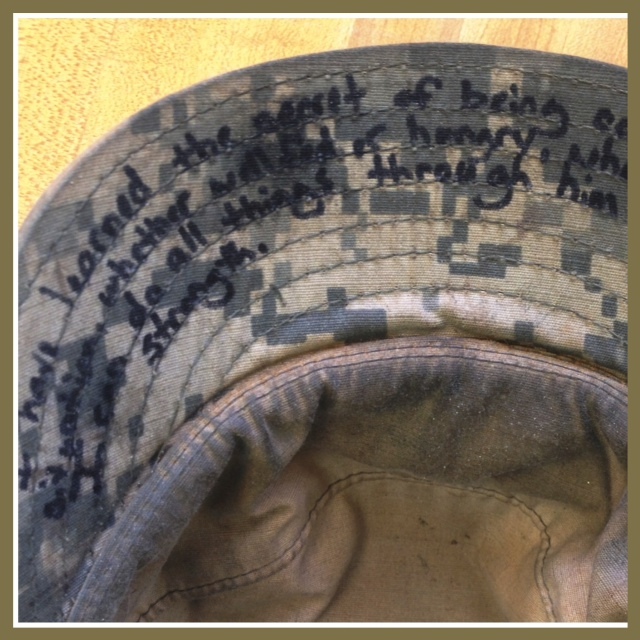 As the Hubs and I were scrambling around to help him on his eight-hour pass from Ranger School, it was clear that Nathan wanted us to see those Bible verses on his combat cap. When our tired boy spoke about these words that afternoon, it was like he was speaking of a great, uncovered treasure. Although Nate has read Philippians 4:12-13 many times before, he understood them now in a more profound way. His current circumstances made the Scripture come alive. It’s so powerful when the Lord speaks to us so individually, don’t you think? I guess when you only gobble down two MREs a day, get maybe two hours of sleep a night and are pushed to your absolute physical and emotional max, you really do know what it is like to be in need and to have plenty. I can’t even imagine. Though I try, it’s beyond my grasp, my heart will only allow me so much understanding or it would crumble. Judging from the letters Nate has sent, in many ways, our Soldier has learned contentment and joy really are found in Christ alone. The strength he summons forth is the result of training, determination and ultimately Jesus. We do what we can on the home-front but Nate realizes that the Lord is his supply. We come up alongside him best we can but the truth found on that combat cap is what really gets him through the rough patches. Oddly enough, Nate didn’t intentionally write those verses on his hat with the foreknowledge of their relevance. 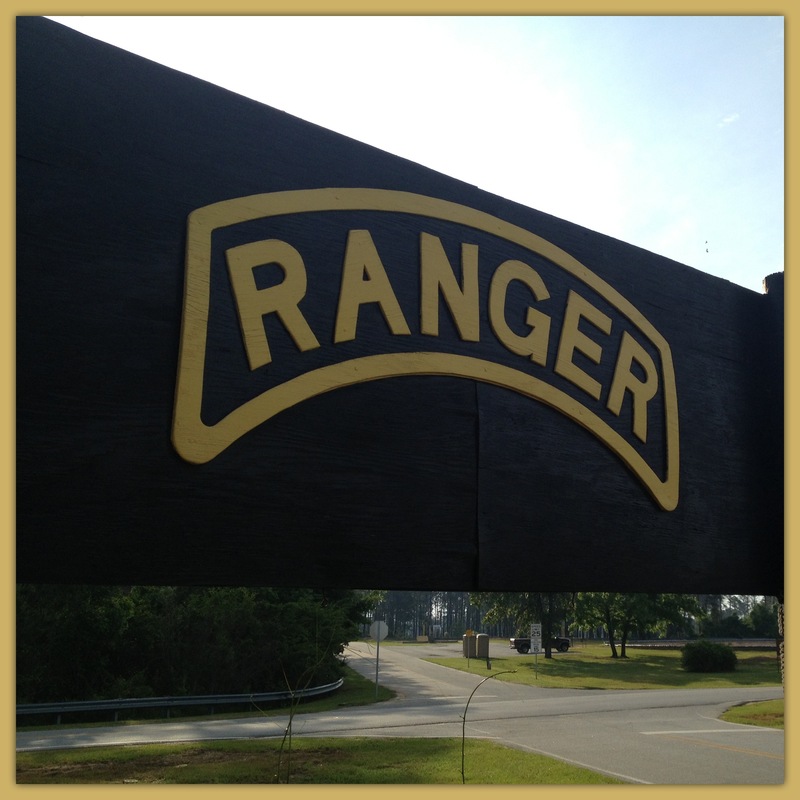 It was only when the chaplain came around to visit the guys during the mountain phase of Ranger School, that Nate put the pieces together and saw how cool it was that he had chosen THOSE verses for such a time as this! He’ll never be able to read Philippians 4:12-13 the same again. Neither shall I. So today on Memorial Day, I’m deeply humbled, proud beyond words to be the mama of a Soldier. I’m also a grateful cousin, daughter-in-law, sister, grand-daughter and friend of military service people. Thank you isn’t enough gratitude for all those who have served. Check out this beautiful patriotic artwork by a military mom! I love this! My boyfriend, currently in mountains, writes me letters with verses all the time. Always brings a smile to my face! So heartwarming Cindy! Thanks for sharing this.